It is frigid here in Maine. It is frigid, or has been frigid, or will be frigid in most of the US at some point this winter. Every (yes, every, including Hawaii) state EXCEPT Florida has seen snow this winter. It’s cold. And as I’ve made the investment to protect my feet with new winter boots (I bought the Sorel Chinooks, LOVE them) it’s also prudent to continue the foot protection with adequate socks. Yep, socks. They are expensive, running about $16-28 dollars a pair. Yes, a pair. 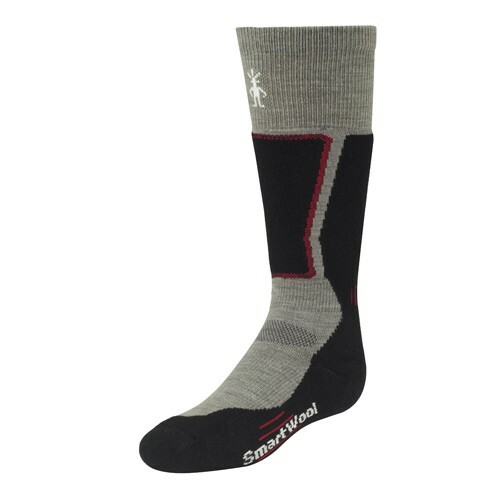 However, Smartwool socks are THE BEST socks I have ever owned. They last forever without pillage or showing a ton of wear. They are warm without being suffocating, and they prevent your feet from sweating which in turn will make your feet cold. Seriously, the difference between wearing boots with Smartwool vs: regular cotton socks is incredibly noticeable. I know, it seems like such a little thing but…the difference it made was…grave. Anyway, forget my Morrissey indulgence for a second, what do you wear on your feet, under your shoes during winter? As you may have ascertained just by reading older posts carefully, I live in Maine. And winters in Maine are cold. And sometimes, for my job I have to spend hours outside in the snow and ice and cold, so it is imperative that my winter footwear be top notch. 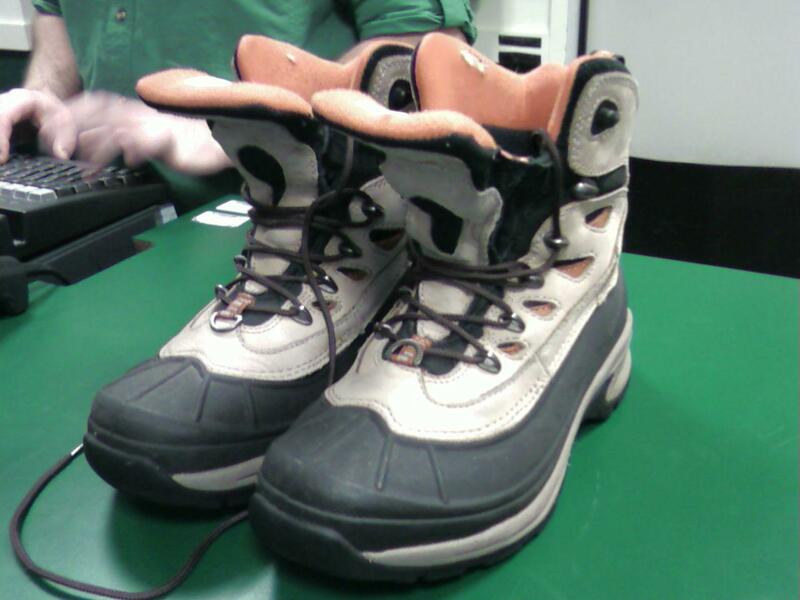 When I moved here almost 8 years ago I invested in these awesome boots that I bought, of course, at LL Bean. I can’t even tell you how much I loved them. 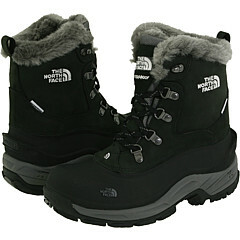 They were warm and kept my feet dry, provided great traction, and were really really comfy. Yeah, they weren’t the most stylish boots out there, but I wear them maybe 30 times a year and they served their purpose. However after this past week’s blizzard, I noticed that one of my feet came out soaking wet – because one of the seams had ripped and was letting water in. LL Bean’s has an AWESOME “if it breaks, whenever, we’ll fix it” policy which is really great – except that most times they will cut you a gift card for the amount of the boots or what their replacement would be in today’s selection. So I got a really big gift card but….the boots they have now do NOTHING for me and were either too girly (the SL actually took my gift card and got a great pair of boots for herself,) not comfy enough or too big (their men’s sizes start at 7.) It was actually not too fun of a shopping trip day (though I did find an awesome wool shirt/jacket which you’ll see in a few days – I didn’t buy it yet but..maybe soon) for me and due to the fact that more snow is on it’s way I may have a had a small, tiny, teeny, insignificant meltdown on the drive home. Cough. These look pretty similar to what I had, and trust me, this is the best color combo (for me) but still – not really my style. 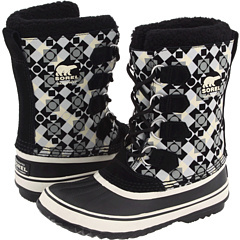 As sartorial as I like to be, I am willing to forgo the style in order for a warm, dry, supportive, comfy pair of winter boots. 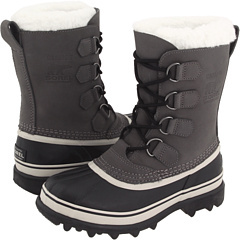 I think one of the major issues with choosing one, outside of the parameters that I’ve already laid out, is that if you have smallish feet, you HAVE to go with a women’s boot because there won’t be a men’s size to fit you, and typically boy’s sizes in winter boots don’t carry enough support to cover the basic needs for me. Do you live in a winter wonderland? 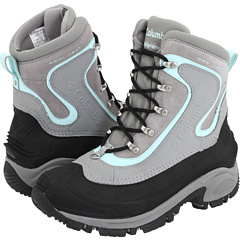 What do you wear on your feet to work/play outside in??? Which of these choices do you like best?? And I knew I had to have them. And now they are on my feet all warm and soft and comfy. What’s your impulse fashion buy of the Fall? 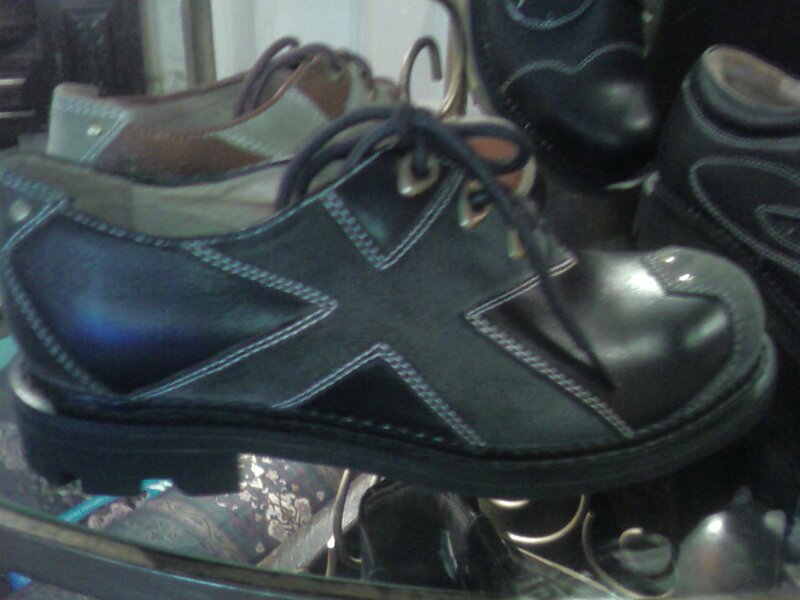 I so love footwear. 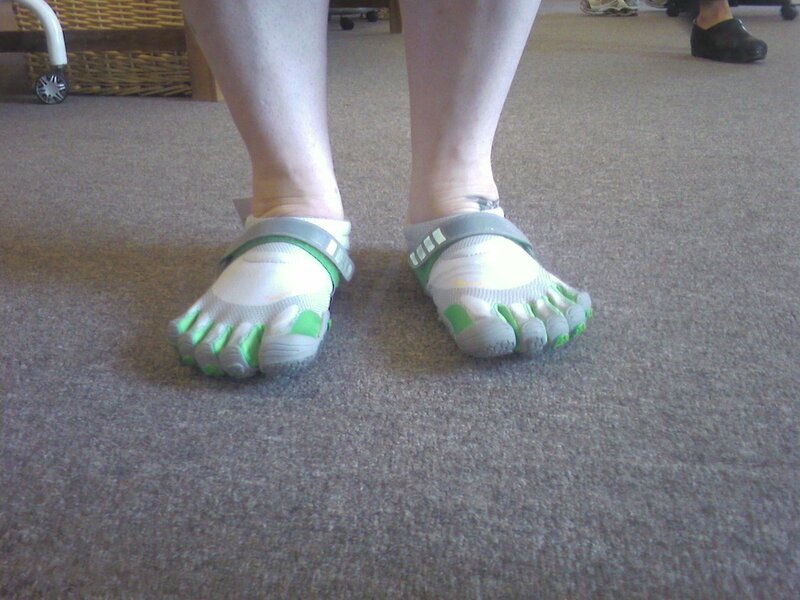 And uh, I had to try these Vibram Five Finger (hahaha. Five finger. Hahahaha. Ok, 12 y/o moment over) shoes on. I did. In some crazy, sports equipment whore moment, I thought I might need to have them. No, Really. See? I did. And well. They’re weird. I don’t think I could run in them. They’re…funny looking. They’re really hard to actually get on your foot. They offer no support whatsoever, which I understand is the point, but for me? Not so much. Maybe if I take up yoga again……. It’s true, I do. I love flip flops and summer footwear. Before I get into the sartorial portion of this post, I have to admit that my favorite flip flops are a pair of 3$ ones that I got at Cliff’s Variety in the Castro around 4 years ago that are black but have colored stripes in the side part of the footbed. They’re almost worn out but are so comfy and I love them so they get to stay for dog walks and quick trips to the supermarket. They are not acceptable (for me) going out footwear, and this post is not a do/don’t, just a what I like/don’t like – and you can take it from there. It’s easiest for me to start with what I don’t like. 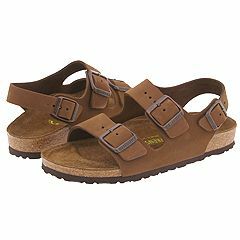 In big, bold, huge letters, I DO NOT LIKE (because hate is a strong word) BIRKENSTOCKS. I know that they’re comfy. And I know that people swear by them. I just think they’re pretty horrendous. Again, if you like ’em, go for it. I don’t think there’s anything classy about them, and mostly they just scream lesbian or European tourist to me. Especially when worn with socks. Which, I know you don’t need the reminder, but you should NEVER do that. 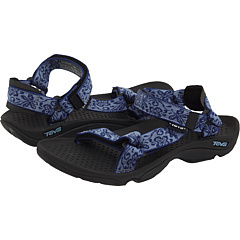 In the category of “outdoorsy” sandals, or sandals that provide more support than flip flops do, I don’t like Tevas. 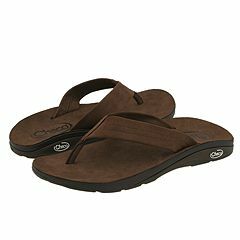 I actually own a pair of these and have kept them probably because they were kind of expensive (and if you want them, they’re yours,) but I don’t find them to be terribly comfortable, and don’t offer the kind of support and function that I’d like an “active” sandal to provide. 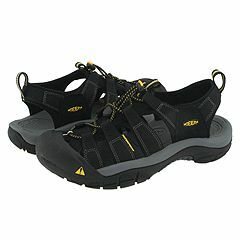 For outside summer activities which may or may not involve me jumping into a river or lake, I REALLY like Keen sandals. I know that I’ve talked about how much I like their shoes, but the first pair of Keens that I had were sandals. I am completely icked out by bugs and icky things like wet seaweed and river beds. These are PERFECT for keeping my feet away from such items, and also, the toe is covered which protects my feet when I’m biking or climbing up river banks. They also dry very very fast, which is a bonus. Now for form instead of function. There’s no reason why you can’t rock a really nice pair of flip flops as going out wear during the summer. 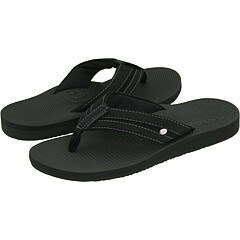 I’m partial to leather, either black or brown, for this type of flip flop. Paired with jeans or khaki’s and a button down shirt rolled up to the elbow this kind of footwear makes for a really stylish, classic casual look. 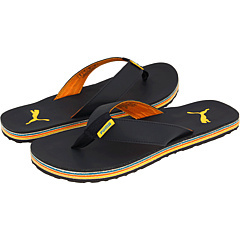 I also think that this offering, from Puma, are really fun, and I can see myself wearing them while on a deck or boat or rooftop with a frosty beverage in my hand while watching the sun set. One thing to pay attention to when selecting flip flops is how they really fit your feet. Often times they’re really flat, with very little arch support, which is really not great for your feet, and will likely leave you feeling not so great after wearing or walking in them for a long time. I had to ditch my “but they’re just flip flops! !” pricing mantra a few years back when I realized that by spending a few extra bucks, I was buying a pair of shoes that don’t hurt and last for more than a few months. Additionally, there are SO many different kinds and colors of flip flops to choose from, you’re practically guaranteed to find a pair that you will be the unique owners of in your town, and you can definitely find some that perfectly express your personal style. What’s your favorite summer shoe option? Do you LOVE a pair that I hate? Tell me why! First a note about sneakers as footwear. I LOVE sneakers as casual footwear, but am a little snobbish in that I feel like if they’re runners, well, they belong in the gym and are more function than fashion. This is JUST my opinion, and you can of course, do whatever makes you feel comfy! I own more casual footwear than I should, and I’m going to start showing what I like for basic black and brown options in this department. When I was 11 years old I got my first pair of Adidas Sambas. I got them because the cool kids (the “older” boys) at the summer camp I went to had them and well, you know, I wanted to be like them. So I got some and they were totally comfy and awesome and for years people asked if I played soccer. And then, somewhere in the 90’s Sambas became really cool footwear and have pretty much been readily available as casual wear since then, and became available in more styles and colors. Ever since 1988 I’ve ALWAYS had a pair of the original black and white Sambas, and they’re my go to for black casual sneakers/footwear. As for brown? 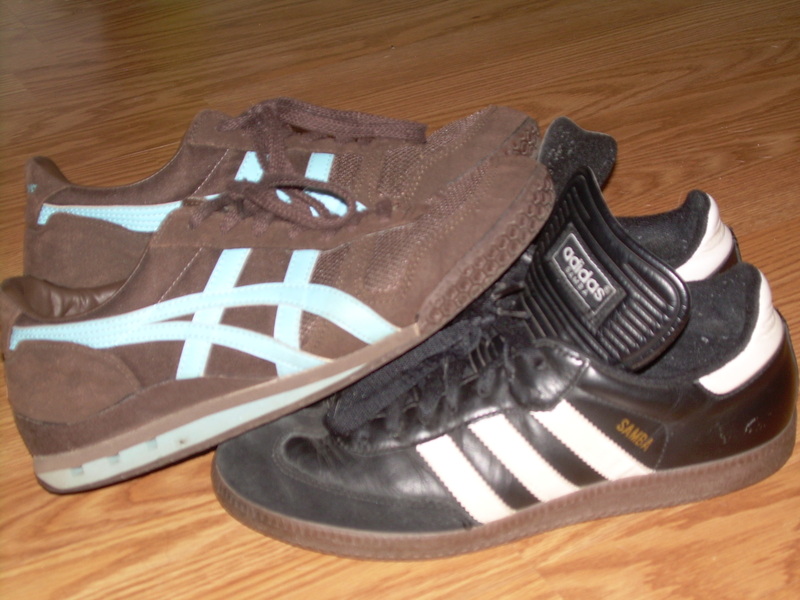 Lately I’ve been wearing Onitsuka Tigers by Asics. I couldn’t find my exact color combo but they make lots, and usually a brown version! Just like the Sambas, these are a really casual, really comfortable shoe. Both of them are fairly neutral as footwear – they won’t take away from any part of the outfit you’re wearing, they look good, and aren’t shouting (which sometimes isn’t a bad thing and we’ll get to that at a later date,) ” hey, look at my amazing shoes!” They just blend really really well. What kind of casual footwear do you like to wear? 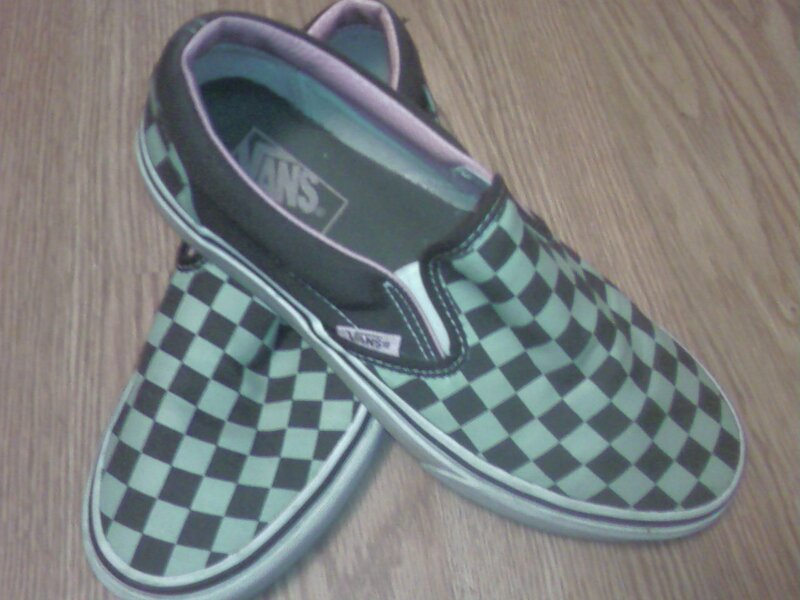 In honor of the holiday that I’ve coined “First Tee-Shirt Day” I’m going to post about one of my favorite pairs of Spring/Summer footwear: Vans. Yup. These are mine. I LOVE these shoes, even though they aren’t quite comfy enough (for me, the flat footed one) to wear all day long, I can do an 8 or so hour stretch in them. If I’m wearing khaki’s and a shirt and tie I can even get away with them as almost appropriate work footwear. Additionally, they pretty much look good with ANY other casual pant/short choice – jeans, cotton pants (white ones look awesome with vans) and cargo shorts. 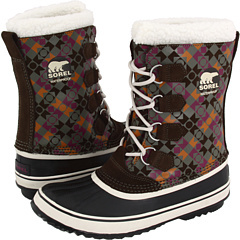 They’re also not so expensive that having a couple of pairs (these are brown, green, and pink) is unattainable. I know that I’ve mentioned my shoe-whoreness before – I really am. This is just pair one of summer/spring casual footwear and there are TONS more to come. Really. I think some of it has to do with the fact that no matter what size you are, there are always going to be shoes that you like that fit – and buying shoes was the only shopping experience that I had as a teen that didn’t end in tears or me feeling really really bad about myself. So shoe buying has pretty much always been a source of joy and happiness for me. What do you love to shop for?